The following description of Boyne’s History of Leeds is taken from a typescript note pasted to a blank page in Volume 1, and which can be found before the History proper begins. The author is unknown, but is likely to have been a previous Librarian at the Central Library. William Boyne (1814/15 – 1893), Leeds antiquarian, used T.D. Whitaker’s 1816 edition of Ralph Thoresby’s Ducatus Leodiensis and Whitaker’s own Leodis and Elmete as the basis for his collection of original material on Leeds. In addition to their value as contributions to local history and topography, the works of Thoresby and Whitaker afforded opportunity for amplification by later workers. This was realised by Boyne, whose collection of material relating to Leeds and the district was itself outstanding. Its accumulation occupied the greater part of Boyne’s life and was only effected by the patience and painstaking methods which were characteristic of all his work. It was from this collection that Boyne drew suitable material for expanding the work of the two historians, and the result is one which can only be described as unique. From the original two volumes the book became seven large folios. Among the items added by Boyne are three hundred coats of arms emblazoned in colour by Madame Dowse. 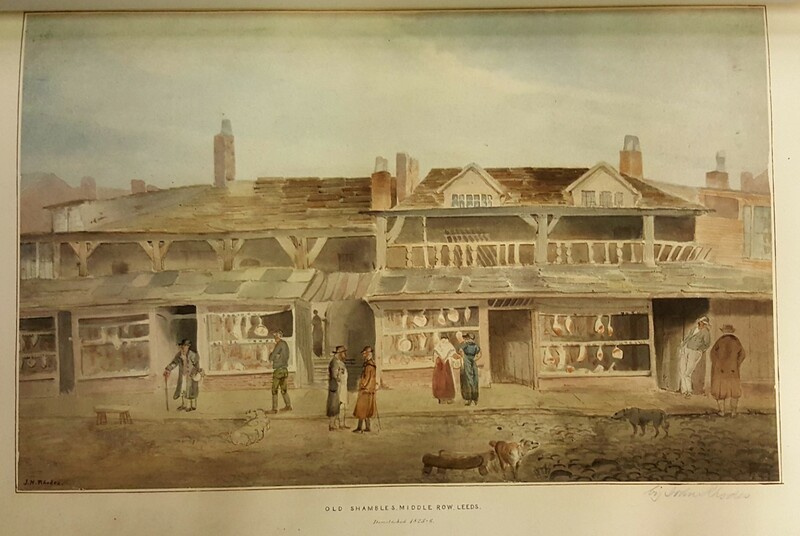 Also included are many original drawings of local subjects in water-colour by John and Joseph Rhodes, W.R. Robinson and William Bowman, with sepia drawings by J. Greig and others. An extract of the West Riding section from Christopher Saxton’s Atlas is also present. The local press is represented by The Leeds Mercury for 8th December, 1767, and The Leeds Intelligencer of 7th September, 1768. Portraits of Leeds worthies, genealogies, and antiquities are also well represented, and there is a considerable section devoted to Kirkstall Abbey. Views of old Leeds and early maps are also included. Probably the most unique portion of the book consists of several letters written by Thoresby and Whitaker, six views of Yorkshire drawn by William Lodge, together with six drawings in pen and ink and two in chalk, also by Lodge. These fourteen drawings were formerly in the possession of Thoresby. “Boyne’s Thoresby”, as it is generally known, with several other of his important works, passed into the library of his friend John Stansfield of Leeds, and after his death was offered for sale with other of his books at Sotheby’s. So unusual an item naturally attracted a crown and made competition keen, but the book ultimately fell to Mr. Reginald Wilson of Leeds, acting on behalf of his father, Mr Richard Wilson, of Lloyds’ Bank. 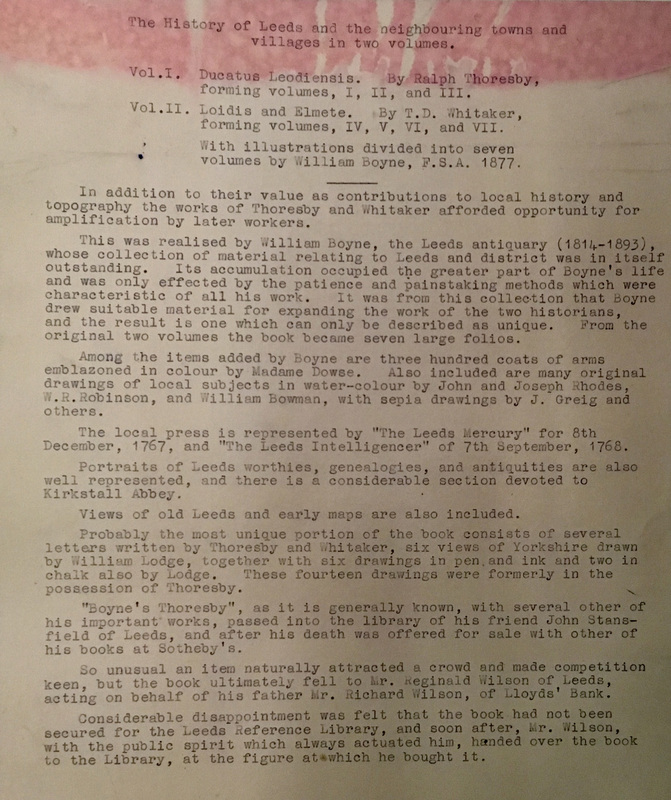 Considerable disappointment was felt that the book had not been secured for the Leeds Central Library, and soon after, Mr. Wilson, with the public spirit which always actuated him, handed over the book to the library, at the figure at which he bought it. A full index to the illustrations and other images featured in the History of Leeds is also available.